Yep. It’s everything cheap thrills me usually can’t stand when watching a horror film. 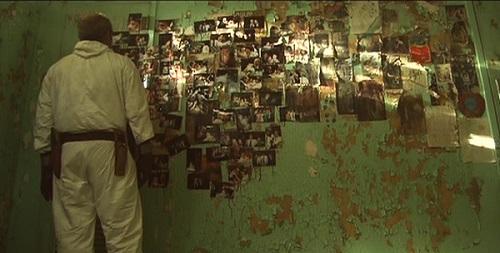 Yet Session 9 managed to jolt me into paying attention the first time I watched it a decade ago. I find it brilliantly eerie every time I see it. The key is, you have to FOCUS with eyes AND ears when you watch it to appreciate more than just the unsettling atmosphere. 5 men going into a huge old mental hospital for a cleanup job sounds like the perfect formula for either a slasher, monster-in-the-walls, or ghosts-turn-everyone-crazy film. It pretty much has been. But Session 9 is more complicated than any of that. The first time I saw the authentic abandoned hospital setting, I thought, “This feels like Silent Hill if it were a movie.” A few years later, Silent Hill would be a movie. Session 9 unapologetically has its characters roaming narrow basement tunnels with only flashlights, and this real feel makes for some amazing suspense scenes. Each of the men has issues. On top of that, there’s a subplot told through therapy recordings of a female patient from years before. You can’t just assume it’s all the babbling of a loony with multiple personalities. The results of these sessions (session 9, of course) tie right in to the outcome of the movie. There are inverted pentagrams on the walls and there is talk of satanic worship, but there are no demons or monsters to be seen. Yet not knowing exactly what the threat is can send chills down your spine, and situations lead you to believe it’s something supernatural. While there is a permanent debate about the conclusion, paying attention to every detail of the film makes it pretty apparent to me that it is paranormal. I’ll say just a few things. First, LISTEN to the “multiple personality” voices carefully and note how they all sound like the same person “doing” voices…until the Session 9 voice. We’re talking United States of Tara turned united states of terror. Also, listen to the very LAST line in the movie. The session 9 “personality” pretty much explains its dastardly tactics. Also interesting are the 9 minutes of deleted scenes, which revolve around a female character—her entire role was cut from the finished product. She was clearly supposed to be a red herring, but her presence would have been confusing, making the audience think she was the mental patient on the tapes, when apparently she was supposed to be just a crazy old squatter. Session 9 isn’t one of those horror movies you can just throw on at a Halloween party so people can scream at all the visual jump scares and gore. It’s essentially an engrossing horror novel acted out on screen. 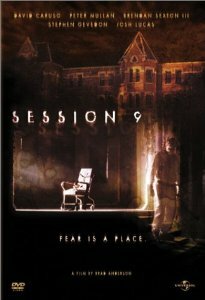 This entry was posted in Movie Times & Television Schedules - Staying Entertained, The Evil of the Thriller - Everything Horror and tagged possession, Session 9. Bookmark the permalink.